And we’re back! Last week’s The Vampire Diaries left us crying and gasping as friends reunited for Bonnie’s funeral and hottie Jesse is now becoming a vampire! For the full recap of last week’s episode click HERE. Halloween editions are always my favorite, though TVD is always spooky themed for me. This week The Monster’s Ball is upon college life and it’s dress up time for the crew. We start off with Dr. Maxfield observing new vamp Jesse. Elena writes her sorrows as she deals with Bonnie’s death, Tyler and Caroline are back together and very much in love, or so we think. Curious Elena knows there is more behind Dr. M and the death of her former roomie Megan. When she meets a random student at Megan’s memorial post she knows he is up to something. It’s kind of cute how Bonnie is still around and hanging with Jeremy. 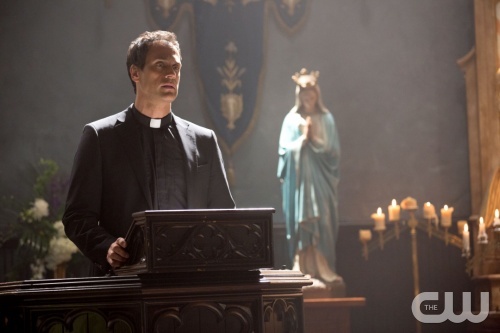 While they are with Damon they scheme for a plan to work with Silas. Bonnie tells Jeremy that this is not a good idea but since no one else can hear her Jeremy says it’s a go! Poor Bonnie is scared about the consequences of abusing magic. So here’s the thing, Silas wants to die, if he takes the cure, which is Katherine, he becomes a witch. If he dies as a witch he stays alive on the other side so he’s not truly dead. That’s where the problem arrives. A mystical anchor that Silas wants to break down so that he can actually die is what is stopping him but Qetsiyah wants to keep it up and protect it so he won’t be able to die. Damon chitchatting with Silas is on the verge of setting a game plan until Silas wants Stefan dead to pursue his interest. At the Ball, everyone is all dressed up and having a semi-grand time as Elena is on the hunt for finding out who Megan’s friend is who is interested in her death. 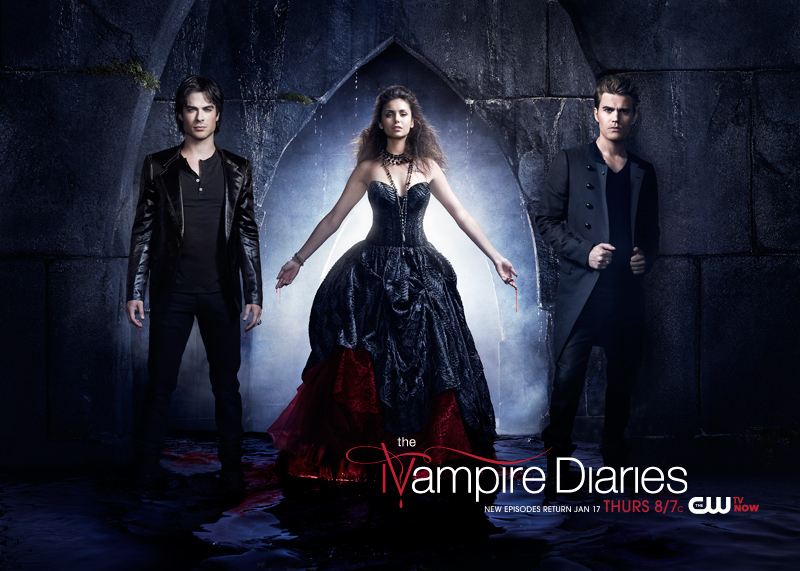 Damon offers up Stefan to Silas, Qetsiyah arrives and is interested in Stefan but Damon swoops him away. Once in the other room Damon snaps Stefan’s neck so that Silas temporarily has his mind reading powers so that he can fool Qetsiyah into giving him answers about the anchor. Dr. Maxfield arrives to the Ball, Elena asks for a dance and asks why he lied on the death certificate. We find out that Doctor himself knows that a vampire ripped her throat out and then warms Elena to leave her school and never come back. Sketchy professor right? But one thing we know is that he cares for Aaron, who happens to be the guy that was questioning Megan’s death. Dr. Maxfield is Aaron’s legal guardian. As we go back to Silas pretending to be Stefan, the real Stefan wakes up and snaps Damon’s neck, runs over to Qetsiyah and tells her that Silas is the one that she’s been talking to. Qetsiyah not one to easily forgive, literally crushes Silas’s heart so he can rot from the inside out. Meanwhile we discover that Katherine has a daughter and it’s none other than Nadia, the traveler. While Nadie has been keeping her for her own reason’s we find out the story of how Nadie was left behind. Sad news comes as Tyler says goodbye once more to Caroline. Tyler who’s on a quest to seek revenge against Klaus tells Caroline that he can’t be with her while he wants to hurt Klaus as much as he hurt him and his family. 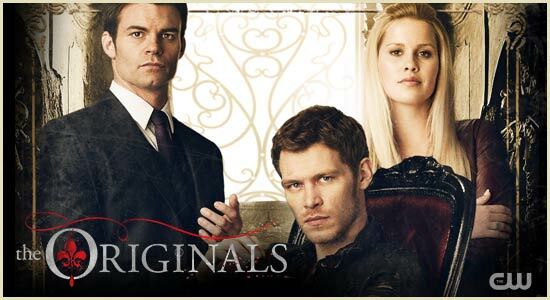 Caroline angered by his attitude gives him an ultimatum, going after Klaus and never being with her again, or staying and being happily together. As Tyler takes a step, we know it’s over. 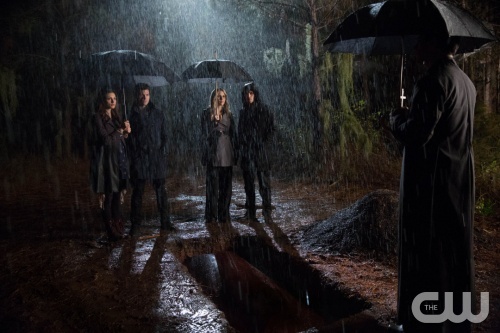 We end this marvelous episode at the Salvatore estate where Damon and Elena have dried up Silas. Katherine joins the gang and gets thrilled as she thinks that she has more time to spare now that Silas can’t get her. Wrong move K, Damon takes her and feeds her to Silas as she screams that she doesn’t want to die. Draining her of her blood, Katherine is left for dead on the floor…or so we think! Next week Silas is up and running and ready to die!